Dr. Muhammad Mukhtar Ph.D. served the American University of Ras Al Khaimah (AURAK), United Arab Emirates. 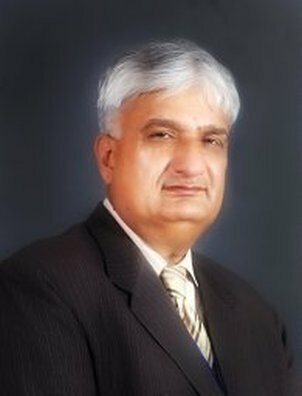 Before his arrival at AURAK, he also served as Vice Chancellor/Professor of three Universities in Pakistan concomitantly – a unique honor for any academic leader. Through his judicious academic leadership and innovative governance, he converted a regional higher education institution in Pakistan to one of the top-ranked in the country. Dr. Mukhtar received his Master and MPhil in the field of Biochemistry from Pakistan and his Ph.D. in biosciences from the Drexel University of Philadelphia, USA, and also completed a Graduate Certificate in Research Management from Thomas Jefferson University in Philadelphia, USA. He served in various academic/administrative positions in the USA on an outstanding scientist (O-1) visa. Professor Mukhtar teaching has been recognized with Outstanding Clinical Faculty Award 2005 from the Department of Bioscience Technologies, Jefferson College of Health Professionals, Thomas Jefferson University, Philadelphia, Pennsylvania, United States of America. Professor Mukhtar is an avid researcher also. His laboratory developed an in-vitro model of the human blood-brain barrier to study viral neuropathogenesis. Dr. Mukhtar as Principal or Co-Investigator has received several awards from organizations including American Diabetes Association, American Society for Microbiology, Diabetes Trust Foundation, US National Institutes of Health, Pfizer Pharmaceuticals, and the Higher Education Commission of Pakistan. Human blood-brain barrier model developed in his laboratory is extensively used to understand ferrying of viruses into the brain and finding cures for neurological ailments. Dr. Mukhtar holds specialized Certificates in Public Health and Bioinformatics. Committed to the role of technology in biomedical research, he serves as managing editor of Frontiers in Bioscience and is on the editorial board of several research journals. He feels pride in mentoring researchers, scientists, teachers and administrators and committed professionals aspiring to excel in their practical life. He has several research publications, including peer-reviewed research, review articles, invited articles, book chapters, commissioned articles and critiques to his credit. A book describing accomplishments of Dr. Mukhtar’s educational leadership has been published in Urdu language entitled “Hayat Zauq e Safar Kay Siwa Kuch Aur Naheen” and it’s English Version “The Making of a Best National University” is in progress.